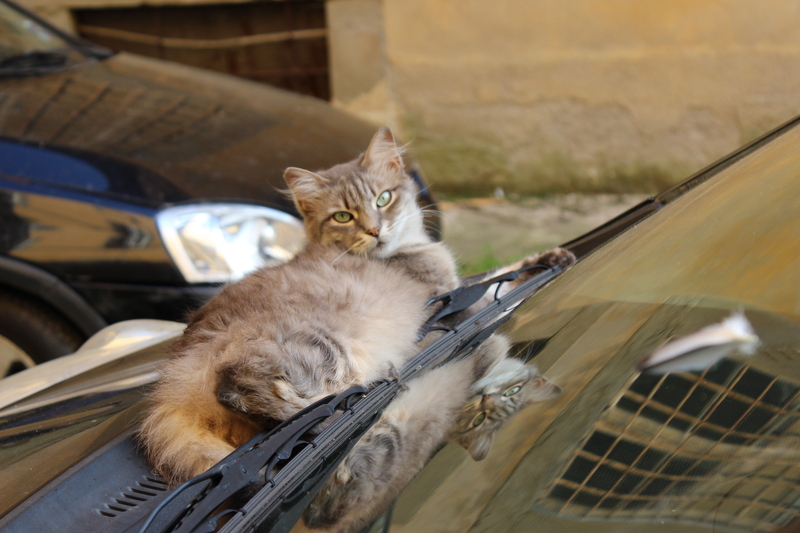 Alley cat lounging on a car hood. Check out her reflection. Bella. I wrote this in late September in Lucca, Italy while listening to an intense thunderstorm. As much as I wanted to include a photo of rain, I could not find one in my photo library, hence this interesting cat. It’s funny how we always want it to be sunny for our photos. I have learned a lesson and will now document rain or shine! Enjoy my first experiment with prose. The sky roars waking the earth with its thunderous baritone. Rain soon arrives pelting the ground with fierce intention. Softer yet deeper rumblings vocalize, then echo as they fade across the universe. Gentle and steady cascades the water, like a summer waterfall. A single “boom” and flash of light signals its cloud bursts must continue. Another long, drawn out tenor note fills the fresh air leaving a lingering stillness. How I love to be surprised with these arias of song on this otherwise ordinary morning. Loved your rainstorm description. Nicely done.